Season over? But it's only September 1st. It seems to be earlier and earlier. I may race next weekend but that is up in the air. Currently just driving back from Greenville. 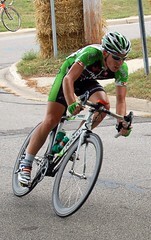 Race was going perfect and I was feeling good going into the last accent up Paris Mountain. That was until I ended up going over the top of a pile of riders who crashed right in front of me at the base of the climb. However I got up checked the bike and started to chase. I thought if I could stay in the cars I'd have a fighting chance. I was doing it until halfway up when like a punch to my stomach my front tire lost all it's air. Game over. See you next time. That's bike racing for you. Let the most nerve racking part of the year begin! Jake, sorry to hear about the flat!! You'll make it to the finish next year! tough break! i'm sure you'll have plenty of other opportunities. The most nerve racking part of the season would be the Detroit Lions football season, right? good one JB, good one.